A very active, intelligent, well balanced and elegant looking dog with good temperament, carrying himself very proudly. Good temperament. (Also refer to Characteristics). Long and fine with slight peak at the back. The skull not broad and with a moderate stop. Foreface strong and well chiselled, not falling away under the eyes; bones and muscle flat. Lips tight fitting. Chin well defined, but not protruding. The whole head must be in proportion to the size of the dog. The leather long and wide, low set on, hanging close to the face. Teeth - white, strong, even, with scissor bite. A full set of 42 teeth is desirable. Shoulders - strong and muscular, sloping well to the back, legs set straight from the shoulders, well muscled. Chest - deep and moderately wide. Ribs - well sprung and rounded. Back - short, strong slightly hollowed, loins broad and muscular. Thighs well developed and muscular, well bent stifles, well let down hocks, hind legs turning neither in nor out. Pasterns strong, tight feet proportionately small, oval in shape, turning neither in nor out, toes arched, pads thick and hard, well cushioned. Docked: Set on rather high, well carried at a slight angle away from the body, never curled or carried over the back, thick at the root. Sound, free movement and light gait are essential. Very profuse and dense of good harsh texture without knots or tangles. All short hair close, thick and curly. It is strongly recommended that the traditional lion clip be adhered to. All solid colours. 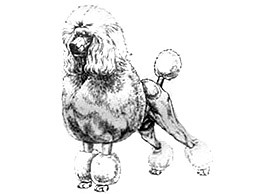 White and cream poodles to have black nose, lips and eyerims, black toenails desirable, brown poodles to have dark amber eyes, dark liver nose, lips, eyerims and toenails. Apricot poodles to have dark eyes with black points or deep amber eyes with liver points. Black, silver and blue poodles to have black nose, lips, eyerims and toenails. Cream, apricot, brown, silver and blue poodles may show varying shades of the same colour up to 18 months. Clear colours preferred. 38 cms (15 ins.) and over. Coarse head, lippiness, snipy in foreface. Light or round or prominent eyes. Over or undershot or pincer mouth. Long back, coarse legs and feet, long flat toes. Open soft coats with no curl. White markings on black or coloured poodles. Lemon or other markings on white poodles.